You are here: Home / Forums / Main Poker Forum / Poker Strategy / NL Heads-Up (stakes: NL50+) / NL50, SRP, Flush draw OTF with one overcard, Shove to a min-raise OTF 35BB deep? Q. Is this a good spot to shove? A. I think so. There are likely many draws and this is a min raise so it doesn’t look like villain is trying to protect a TP hand against any draws I might have. If we assume that villain is min-raising with all his decent* 7x, 8x, 9x and Tx plus a bunch of decent flush draws of his own then we have 47% equity plus a lot of fold equity! Q2. Should we do the same when we don’t have the overcard? A2. Without an overcard I simply call and take the odds. A hand like 42s here has 37% equity which is a big difference. With AK here we would be ahead of that range with 58%. 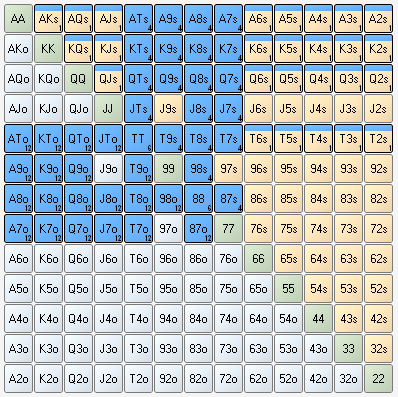 * I arbitrarily used all hands north and west of the pocket pairs on the range chart to consider what hands might be considered “decent”. Like Jon said, we don’t usually have a lot of fold equity versus short stacks, so I would just take my cheap equity. I might jam a combo draw or a FD with two overcards, where we really don’t care if we get called. why would we shove? vs tp 2.pair we are behind. fold equtiy is less as in 100BBs spots.